With The Llewellyn Tarot Anna-Marie Ferguson (creator of Arthurian Tarot) has produced another themed deck, this time honoring the Welsh heritage of Llewellyn Publications� founder, Llewellyn George. Since Welsh heritage and history is pre-Christian, several of the Major Arcana reflect the pagan mythos of the times. 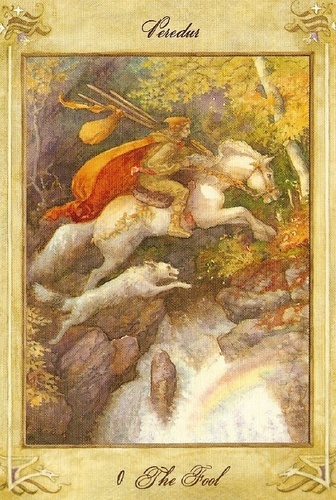 The Minor Arcana are illustrated and follow the traditional Rider-Waite-Smith images. The Fool is accompanied by the usual white dog but here the dog is larger and it is leaping with him. The symbology here is that the subconscious is working in concert with The Fool�s consciousness to drive him forward with courage and purpose. The rainbow lends a true sense of adventure, encouraging us to find our pot of gold.